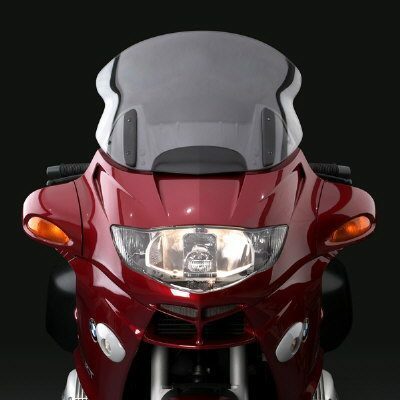 BMW R1100RT windshield Ztechnik BMW R1100RT windscreen Vstream Z2401 BMW R1100RT windshield by ZTechnik ® revolutionizes windscreen performance. The advanced V-shape and dimensional contours of the VStream® windshields push the wake, typically referred to as the von Karman vortex, out and away more than 4 inches from the side of the rider's helmet. The rider then resides in a quiet and calm air pocket. This improvement is notable for the passenger as well. State-of-the-art Quantum™ coated polycarbonate gives VStream windshields outstanding clarity and strength characteristics unmatched by any windshield maker worldwide. This exclusive combination of Quantum and polycarbonate is 30X more resistant to abrasion than acrylic materials, has better UV life, chemical resistance, and optical definition, and has superior crack and impact resistance. Lexan polycarbonate not usual cheap weak perspex/acrylic!! these screens are bulletproof- see our video for proof!